A brilliant free kick in added time saw Iraq beat Vietnam 3-2 in Group D at the Asian Football Confederation Asian Cup in the United Arab Emirates. Ali Adnan's curling left-footed strike in the 91st minute ensured the 2007 champions took all three points from what was a match marred by defensive errors at both ends. After a slow start at the Zayed Sports City Stadium in Abu Dhabi, Hussein Al Saedi's long range shot for Iraq came close to breaking the deadlock on 14 minutes, only for Dang Van Lam to tip it past his post. It was Vietnam who eventually took the lead when in the 24th minute an incisive pass from Nguyen Quang Hai caused defender Ali Feaz to accidentally back heel the ball into his own net. However, having taken the lead thanks to a defensive error, a mistake of their own from Vietnam then gave Iraq an equaliser. Shortly after the half-hour mark Do Duy Manh, turning away from his own goal just outside the box, had the ball taken off him by Mohanad Ali Kadhim who then surged into the area and fired home for 1-1. In the most action-packed period of the match Vietnam then retook the lead just three minutes later when Iraq's keeper parried an initial save straight to Nguyen Cong Phuong, who was able to bundle home the rebound. Iraq once again pressed for an equaliser and it came after 60 minutes from another goalkeeping error. An initial header from Kadhim was saved by the goalkeeper, but getting himself into a tangle the nearest defender was then unable to clear. As a result the ball found its way to Humam Tareq, who after a bit of jostling was able to smash it into the roof of the net. As the match entered added time it looked as if the game would end all square, until Adnan stepped up to a dangerous free kick on the right hand side and promptly curled it expertly into the Vietnamese goal to seal all three points. It means after one match Iraq now sit second in Group D on goal difference behind Iran, who beat Yemen yesterday 5-0. In the day's other game Saudi Arabia thrashed North Korea 4-0 at the Rashid Stadium in Dubai to take an early lead in Group E.
The first half ended with Saudi Arabia 2-0 up and North Korea down to 10 men. 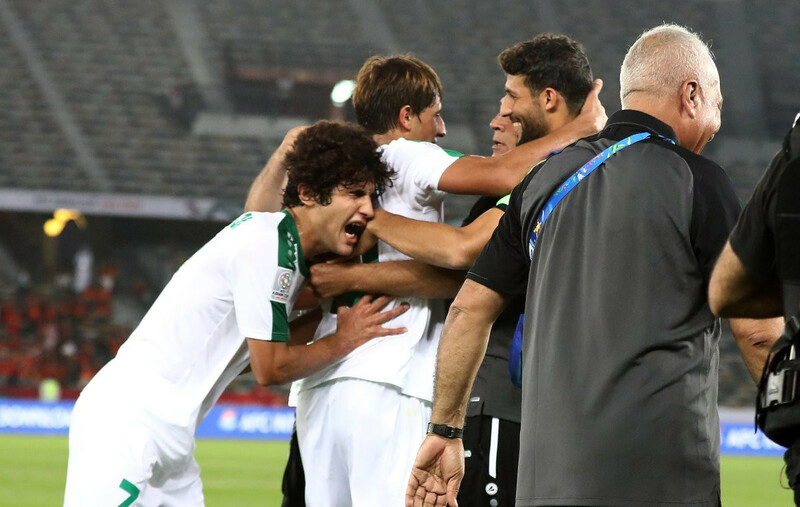 Han Kwang Song was given his marching orders for a second yellow card just before half time, after Hatan Bahbri and Mohammed Al-Fatil had both scored for Saudi Arabia. Another two goals in the second half from Salem Al Dawsari and Fahad Al Muwallad put the result beyond any doubt. The other two teams in the group, Qatar and Lebanon, will face each other tomorrow.